On three mornings this summer, multidisciplinary artist McKendree Key brings her project The Breakfast Den to the lawn on the High Line at 22nd Street, to engage artists and members of the public in meaningful conversation. By carving out this time and space for the everyday acts of eating and gathering, the artist means to generate a new kind of social interaction. B.Y.O. (Bring Your Own) is a new series of intimate, unscripted conversations staged in public space. 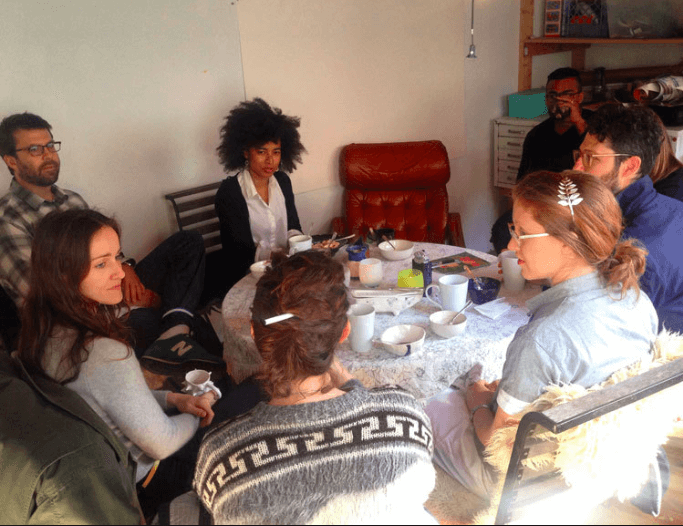 Hosted by artists who center their practice on food and dialogue, these events contribute to an exploration of critical thought, creative exchange, and discourse production. B.Y.O is inaugurated this year with McKendree Key’s The Breakfast Den, Heather Hart and Jina Valentine’s The Black Lunch Table, and Elia Alba’s Supper Club. This program is open for the public to become a first-hand participant and join the discussion. Space at the table is limited. We will send a reminder 5 days before the program to reconfirm your participation. Breakfast is provided for participants. Participants will be required to arrive 15 minutes before the start time, and by the time of the program any unclaimed tickets to participate of the conversation will be released to the waitlist or walk-in audience members. Conversation will be prompted and framed around large critical themes: Aging/June, Utensils/July and Masks/August; participants need no previous experience or knowledge. High Line at 14th St.